Starling Fitness - Fitness, diet, and health weblog » What Are Your Favorite Songs To Run To? I laughed out loud when I saw this Facebook post on Imgur the other day. 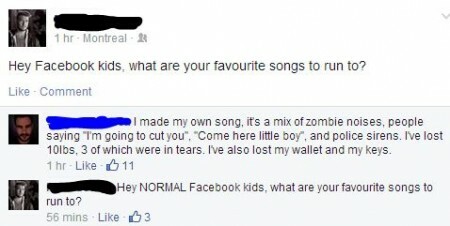 Montreal: Hey Facebook kids, what are your favourite songs to run to? Friend Replied: I made my own song. It’s a mix of zombie noises, people saying, “I’m going to cut you,” “Come here little boy,” and police sirens. I’ve lost 10 lbs. 3 of which were in tears. I’ve also lost my wallet and my keys. Montreal: Hey NORMAL Facebook kids, what are your favourite songs to run to? I don’t know how beneficial it is to do that workout every day, because it might cause enough stress on your body that it negates any benefits you might get from it. The more important question, however, is what music is good for working out and I have talked about that A LOT! I could never narrow things down to one or two songs, so I literally have HUNDREDS of songs in my workout playlist. The good thing about that is that I can listen to my tunes with every workout and not get sick of them.